All the requested estimates are provided free of charges and without any obligation to the artist. 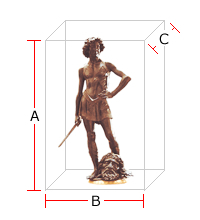 To obtain an estimate it is sufficient to provide us with a drawing or a photo of the work to be reproduced, sent by mail, fax or e-mail, specifying the height, width and depth and the requested finishing for the bronze sculptures, for example normal or smooth. If necessary we can give estimates for enlarging, rubber mold, bronze casting, time of delivery, crating, shipping by sea or by air, and installing. 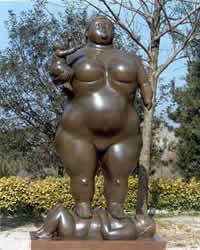 Fernando Botero – Sculpture “Woman with child”, work by sculptor Fernando Botero, 2,1 metres high. 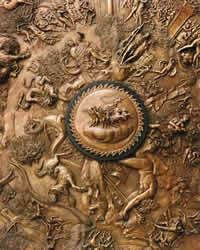 Alessandro Romano – detail of sculpture showing “Achille’s shield”, work by sculptor Alessandro Romano, diameter size 195 centimetres. By submitting the present form I automatically authorize the processing of my personal data on behalf of Massimo Del Chiaro Foundry only for internal statistic purpose and in replying to the present. My data however will not be given to anyone and can at any moment ( art. 13) be cancelled. I accept the terms of the privacy information note.